Poll: Which Historical Figure Does Trump Most Resemble? Today’s poll asks readers to choose which historic figure Trump most resembles. We will be posting the results later this weekend. Today’s poll ask readers to choose which of four historic figures Trump most resembles in their estimation. He threatened the press, joked about ruling for life and bullied everyone, including the allies who helped him get into office, while enjoying a cult following among his base. When a special judicial investigation threatened to reveal his financial corruption and complicity in criminal acts, he did not hesitate to destroy the democracy he led to remain in power. 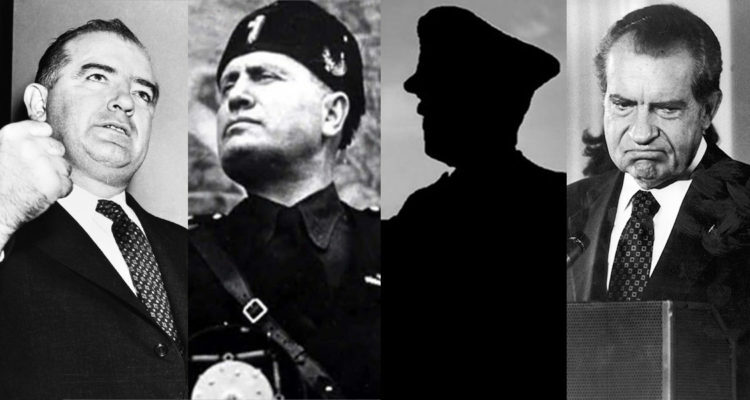 Benito Mussolini created the world’s first Fascist dictatorship not just as a counter to the powerful Italian left — that’s a well-known story — but also as a desperate act to avoid prosecution…. Mussolini undermined the institutions and culture of Italian democracy persistently and methodically. He denounced any negative press coverage of him as “abusive” and “criminal,” and demanded that the offending reporters and editors be fired… He dismissed officials who were insufficiently servile. He bullied Parliament into passage of an electoral law that guaranteed his coalition’s victory in the 1924 elections. And he stayed silent when Fascists beat up or killed opposition politicians. Setting that aside, human rights group The Anne Frank Center took to Twitter last summer to post a comparison of Trump’s America and Hitler’s Germany which warned of “alarming parallels” between Trump and the infamous Nazi leader. As the comparisons are well-known, with Special Counsel Robert Mueller closing in on the Trump administration, we are going to refer to a Politico article discussing Trump’s historical antecedents.